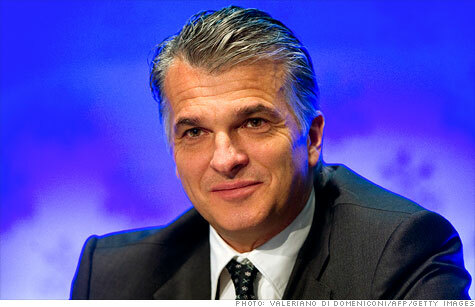 UBS's new CEO Sergio Ermotti announced plans to cut 2,000 jobs at the company's investor day Thursday. NEW YORK (CNNMoney) -- As protesters find new ways to "Occupy Wall Street", major financial firms have been busy handing out pink slips this week. Bank of America (BAC, Fortune 500) and JPMorgan Chase (JPM, Fortune 500) commenced new rounds of job cuts this week, following the lead of Citigroup (C, Fortune 500), Goldman Sachs (GS, Fortune 500), Credit Suisse (CS) and RBS. Most of the layoffs at Bank of America this week came from the firm's investment banking and capital markets divisions, according to a source close to the firm. A Bank of America spokesperson declined to comment. In September, Bank of America announced planned cuts of 30,000 employees over the next several years. JPMorgan Chase's spokesperson wouldn't discuss whether any jobs had been cut or any numbers. "There were no job cuts beyond those previously announced months ago." In the firm's third quarter earnings conference call, JPMorgan Chase's CEO Jamie Dimon said the firm would see a reduction in headcount but no major layoffs. Sources familiar with the bank's activities this week said that a number of traders were handed pink slips this week. "Things have gotten pretty bad, pretty fast," said Richard Lipstein, managing director of the executive search firm Boyden. Lipstein said he's seen a big uptick in jobseekers over the past two weeks, particularly among midlevel executives. Mid-to-late November is typically the season for layoffs, as banks want to avoid making cuts during the holidays in December. By doing it before year-end, these employees aren't eligible for bonuses. UBS became the latest firm on Wall Street to announce new specific rounds of terminations. At the firm's annual investor day at the Waldorf-Astoria hotel in New York Thursday, UBS's (UBS) new CEO Sergio Ermotti said there would be 400 additional job losses in the firm's investing banking division on top of 1600 announced in August. That will prune roughly 11% of the firm's investment banking staff, or 2,000 positions, by the end of 2016. "Layoffs have been expected, but what's a little different this time is that firms are being more open about it and in some cases, actually inflating their numbers," said Alan Johnson, managing director at Johnson Associates, a compensation consulting firm. "Firms are trying to show how prudent they are." It's not surprising that bank executives are trying to at least give the impression of frugality. Bank stock prices have been decimated in 2011. Shares of Bank of America, for example, are down 56% this year. Meanwhile, since Wednesday, bank stocks have fallen precipitously after Fitch Ratings put out a report outlining how US financial firms could be adversely affected by the EU sovereign debt crisis. This week Citigroup (C, Fortune 500) announced that it would make "targeted headcount reductions in certain businesses and functions," according to a company statement. It is estimated that 3,000 jobs -- or about 1% of Citigroup's staff -- will be cut, but a source familiar with Citigroup's plans said the firm is still finalizing its plans for cuts. Among Bank of America's layoffs this week, the company eliminated employees who had joined as part of its merger with Merrill Lynch. Bank of America cut several high-level employees in its prime brokerage division, which helps the bank execute trading on behalf of hedge funds. Meanwhile, analysts think the worst may be over unless the economy does dip into another recession. "I don't expect there to be more big broad based cuts like we had in the securities industry in 2001 or 2008," said Jeff Harte, a banking analyst at Sandler O'Neill + Partners. "Ultimately I don't think we've built up a ton of excess capacity unless the environment gets a lot worse."